Is there a way to smooth the blending when appending an aquifer Rw3D file to a Stratigraphy Rw3D file? When I append these two models together, it looks very splotchy. See attached image for reference. 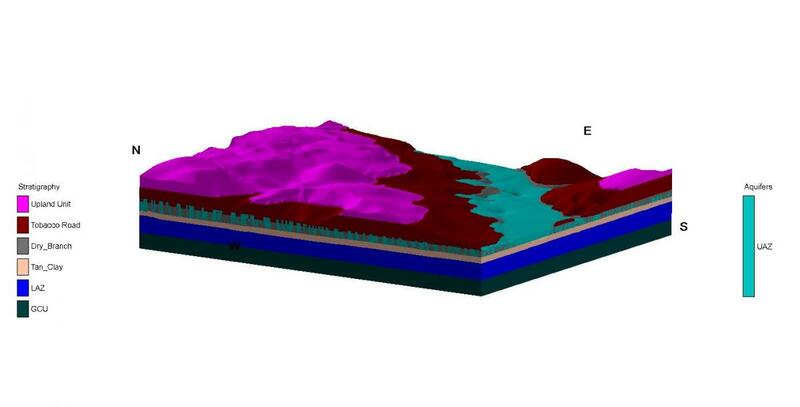 The easiest way to prevent the sides of the Tobacco Road formation from blending poorly with the sides of the Aquifer model is to turn off the Sides of the Tobacco Road formation in RockPlot 3D. In the Object Manager on the left, click on the "+" to the left of the Stratigraphy Model item to expand the list. Click on the "+" to the left of the Tobacco Road item to expand that item. Remove the check mark from the Sides item to turn off the side panels of the formation. Another method is to edit the RwGrd files for the Aquifer model to make them extend slightly beyond the XY limits of the Stratigraphy model layers.